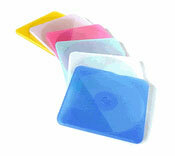 Our new CD/DVD cases are a new and innovative way to protect and store your CDs and DVDs. Made from durable, impact resistant Polypropylene plastic. It is just like "tupperware"!